For this year's RTÉ Culture Night extravaganza on September 21st, Arena's flagship Dublin Castle gig is crossing the river - and it’s breaking all kinds of new ground. Find out more (and get tickets) here. 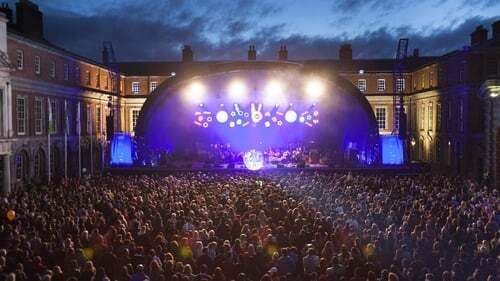 RTÉ is marking Culture Night by bringing its popular open-air concert to a new location at the National Museum of Ireland Collins Barracks on Friday 21st September. The free two-hour concert will broadcast live on RTÉ Radio 1’s Arena from 8pm-10pm and streamed live here on RTÉ Culture. NB: This concert is free to all, with no tickets required. Arena’s Sean Rocks presents an evening of live family entertainment in the company of the RTÉ Concert Orchestra and very special guests, presenting an exciting mix of live music, theatre, comedy and poetry from both established and emerging Irish artists. The concert will also feature a choir of 140 members of the public from around the country. Gavin James - The globally acclaimed singer-songwriter pays tribute to The Cranberries' Dolores O'Riordan with a performance of Linger. Moxie - A performance – with special guests – from musicians creating a new brand of Irish music heavily influenced by electro, jazz, house, and rock. In addition to this free open-air concert, from 4-8pm there will be a wide range of free ticketed live radio recordings, talks and performances throughout the National Museum of Ireland Collins Barracks. Culture Night attendees are invited to be part of the studio audience for live recordings of a plethora of arts and culture programmes for RTÉ Radio 1. Get a front row view of these radio shows in the making, and get up close and personal with a host of guests, artists and panellists as they discuss the broad and the narrow aspects of our Culture, past and present. Sunday Miscellany (4-5pm, Asgard Room): Presenter Sarah Binchy will discuss all things culture with leading writers, Eileen Battersby, Niall McArdle, Sharon Hogan, Chris McHallem and Deirdre Mulrooney. Live music comes from some of Ireland’s leading young musicians,Martin Tourish, Tríona Marshall, Zoe Conway, Niwel Tsumbu, and Simon Morgan. Updated: This event is now fully booked. Readings (5-5.30pm, Audio Visual Theatre): Winning short stories from the RTÉ Radio 1 Francis MacManus Short Story Competition and conversations with their authors. Playing with Words (5.45pm – 6.45pm, Asgard Room): An evening of song, poetry, prose, as our panel discusses how literature, poetry, plays and song have helped celebrate sporting moments and how major sporting moments have influenced Irish society and Irish literature. Updated: This event is now fully booked. Culture Cabinet (7-8pm, Asgard Room): Four special guests open their Culture Cabinet, where they share their stories about their most treasured possessions that have a cultural significance for them. Comedy Gold (6.30pm-7.30pm, Audio Visual Theatre): A fantastic line up of new and emerging comedy talent. Andrea Horan (4.30pm–5pm, Audio Visual Theatre): Andrea is founder of Tropical Popical nail salon in Dublin City Centre and co-host of Don't Stop Repealin' podcast. Get your tickets here. Ivana Bacik (5.30pm–6pm, Audio Visual Theatre): Ivana has been a senator in Seanad Eireann for the University of Dublin since July 2007, and is also the Reid Professor of Criminal Law, Criminology and Penology at Trinity College Dublin. Get your tickets here. Emilie Pine (7.30pm–8pm, Audio Visual Theatre): Emilie is the best-selling author of Notes To Self (Tramp Press) and Associate Professor in Modern Drama at UCD. Get your tickets here. Culture Night with RTÉ will also be at the National Concert Hall, where RTÉ Cór na nÓg and the newly formed youth choir, RTÉ Cór Linn will perform on the steps of the John Field Room (from 6-6.20pm). In the main auditorium, from 7-9pm, the RTÉ National Symphony Orchestra with Principal Guest Conductor Nathalie Stutzmann and soloists will perform Rossini’s William Tell Overture, Mozart’s Sonfonia Concertante for Violin, Viola and Orchestra and Dvořák’s Symphony No.7. If you can’t make the concert, Paul Herriott presents the concert live on RTÉ lyric fm’s The Lyric Concert from 7.30pm. Get your tickets here. Free transport: Dublin Bus is running free buses every 20 minutes from Dublin City Centre (Aston Quay, USIT Office) to the National Museum of Ireland Collins Barracks (Route C) from 6-11pm. For more on free transport, visit www.culturenight.ie/transport. Stay tuned to RTÉ Culture for Culture Night updates, and fnd out more about Culture Night events nationwide here.